DD Form 2944 or the "Claim For Retroactive Stop Loss Payment" is a Department of Defense-issued form used by and within the United States Army. The form - often mistakenly referred to as the DA form 2944 - was last revised on March 1, 2010. Download an up-to-date fillable PDF version of the DD 2944 down below or find it on the Department of Defense documentation website. FAX TO THE SERVICE UNDER WHICH YOU SERVED WHILE ON ACTIVE DUTY AT THE ADDRESS LISTED ON THE FOLLOWING PAGE. AUTHORITY: Public Law 111-32, Section 310; E.O. 9397. The DoD "Blanket Routine Uses" apply. information are needed to pay the proper person, ensure entitlement to benefits, and for tax purposes. such reenlistment or extension of service are not eligible to receive the Retroactive Stop Loss Special Pay. they served in to submit their appeal. Final determination on granting benefits under this program is the responsibility of the Military Departments. In addition to this form, submit documentation as listed below. The Military Departments may request additional documentation as necessary. 1. 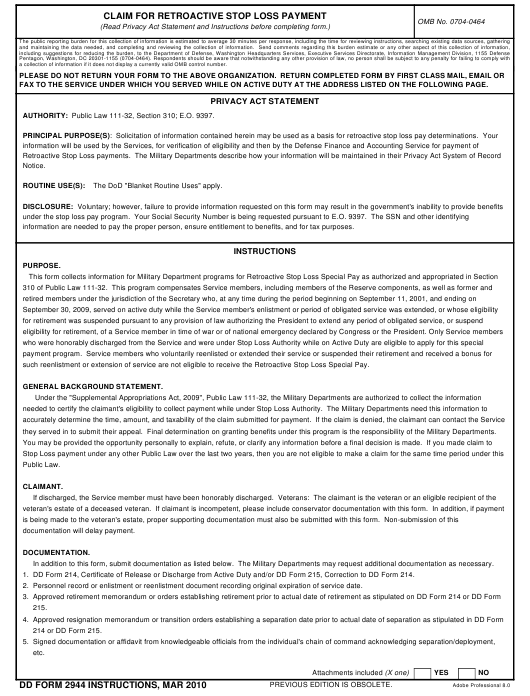 DD Form 214, Certificate of Release or Discharge from Active Duty and/or DD Form 215, Correction to DD Form 214. 214 or DD Form 215. THIS PROGRAM ENDS ON OCTOBER 21, 2010 AND THIS CLAIM MUST BE FILED BY OCTOBER 21, 2010. Please type or print legibly. * If deceased, attach documentation establishing the beneficiary. original release signed by me.